What’s one relatively quick and effective way to cut the carbon footprint of coal-fired power plants? A team of Canadian and Japanese researchers believe they have an answer: switch at least part of the power plants’ fuel from coal to biomass. Currently, coal-fired electricity generation is responsible for about 20 per cent of the world’s greenhouse gas emissions. Yet coal-based power plants could keep generating energy cost-effectively and reduce climate-altering pollution significantly by using a fuel blend of coal and wood pellets instead, according to a new study led by Heather MacLean, an associate professor in civil engineering at the University of Toronto. 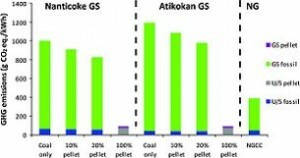 Completely replacing coal with wood pellets has the potential to reduce greenhouse gas emissions by 91 per cent for a coal plant, and by 78 per cent for natural gas combined cycle power plant, the researchers report. The switch also reduces emissions of nitrous oxides (by 40 to 47 per cent) and sulphur oxides (76 to 81 per cent). However, even burning a mix of 10 or 20 per cent wood pellets with coal — co-firing — carries significant benefits, both in reducing greenhouse gas emissions reductions and in increasing the cost of electricity at a price that’s competitive with retrofitting coal plants to reduce emissions. And that’s without factoring in the possible additional cost to coal power if a cap-and-trade system were to be enacted. Burning wood pellets to produce electrictiy to avoid more air polution.